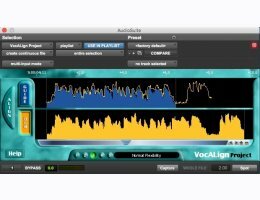 VocALign Project 3 provides the latest version of the basic and legendary VocALign program that has been available since 1995, providing instant tight alignment of one audio signal to another. Simply capture a Guide signal with the right timing, capture a Dub signal to be aligned, press one button, and a new aligned Dub is generated and returned to your DAW. Instantly edits one audio signal to match the energy patterns in another audio signal. Works with voice, musical instruments and sound effects. Provides time saving and quality benefits for ADR, tightening double tracked vocals and backing harmonies, foreign language dubbing, etc. Plug-ins for most popular DAWs plus a stand-alone version. VocALign Project takes just seconds to automatically align two audio signals so that the timing of one matches the other. Work with different speakers, singers, words, instruments and sounds. The aligned audio can be auditioned within VocALign Project. Scrolling, scalable display allows instant visual confirmation of sync. User interface allows adjustment of selected audio regions for processing. User-adjustable processing presets ensure optimal performance. Pitch of aligned audio is unchanged.